It has become increasingly clear to me in recent years that North American evangelical Christianity suffers from a lack of confidence in and appreciation for Beauty. We pursue and call for the Good and the True, yet our strategy has centered primarily on syllogistic rationalism. We’re not all that apt at aesthetics. We love Truth, but we’ve forgotten that whatever is true is also beautiful, and we’ve forgotten that Beauty itself is deeply persuasive. There is no argument against beauty. 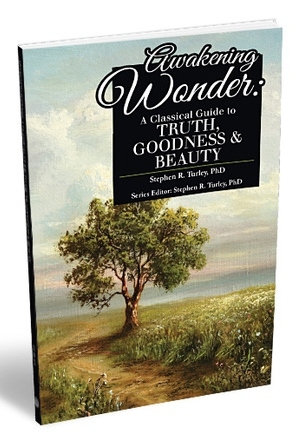 Given my growing interest in the role of theological aesthetics in pedagogy and apologetics, I was very excited to see Stephen Turley’s new book from Classical Academic Press (CA), Awakening Wonder: A Classical Guide to Truth, Goodness, and Beauty (2015). I’ve been following the work of CAP for several years now and have found their resources invaluable. This book is no different. Turley’s book introduces the reader to the role of Truth, Goodness, and Beauty in shaping human life through a distinctly Christian education. The book opens in dialogue with C.S. Lewis to survey the way contemporary Western culture has redefined what it means to be human by removing objective value from our common life (chapter 1). This is followed by a look at the birth and development of Truth, Goodness, and Beauty as objective values in the classical world, and Plato’s role in that development receives focused attention. (chapter 2). Turley then traces the development of these values by the Christian Church in the Greek East (chapter 3) and the Latin West (chapter 4). All of that then serves as the foundation for his argument that the recovery of objective aesthetics by classical Christian educators provides the necessary tools to redeem the senses (chapter 5), sanctify the imagination (chapter 6), and reform education (chapter 7) in order to provide an environment in which our children grow up to embody the objective values of Truth, Goodness, and Beauty. The strength of the book is the author’s ability to synthesize and communicate a significant amount of material across a variety of disciplines and apply it to the contemporary classical Christian education project. The coherence of the argument embodies the values it promotes. The God who raised Jesus from the dead is perfectly beautiful, and his beauty beckons us. Turley has provided a framework for developing our ability to perceive the divine beauty which calls us with joy to himself. The result is the recovery of that which we have neglected in the modern period, and the rediscovery of full human life that faithfully incarnates the sacred vocation to shine forth the beauty of the glory of the triune God in whose image we are made. Take and read. ← In biblical theology, human life is embodied life.